We are only able to carry on our work through the generosity of individuals, institutions and people like you. Please take the time to make a donation. We value every gift we receive and ensure that your money goes straight to where it is needed most. Help us make a difference to the people of the ‘Hidden Himalayas’ by selecting one of the options below. Would you to consider committing to a regular monthly or yearly donation? Knowing that you will continue to be there will help us plan for the long term, raise our profile and enable us to secure further funding. For a small regular payment, you can join the Nepal Trust by becoming a friend or member, and work alongside us to offer the people of Nepal a brighter future. Donate Online via one of our secure server facilities. 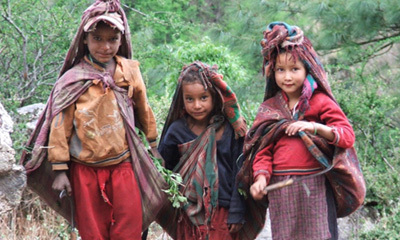 This project provides basic healthcare -and education in the least developed area of Nepal. There are no roads in Humla and the government health system is dysfunctional. Maternal and child mortality rates are some of the highest in the world (<30%). More than 50,000 people live in the district. The project is integrated with education, food security, WASH, renewable energy and income generation projects to promote a healthier lifestyle and a secure future for, particularly, women and children. This project will provide repair/ maintenance services and vocational trainings through a Service Center for renewable energy schemes built by The Nepal Trust, the government and other agencies. NW Nepal is very remote and support facilities non-existent; when systems break down or require servicing local communities have no access to specialized services. This center will create a platform, by maintaining energy systems and sustaining local infrastructure, whilst supporting local businesses. The earthquake in Nepal on the 25th April, 2015 has shattered the lives of millions of people destroying homes, fields and livelihoods. Sindhupalchowk district, to the north of Kathmandu, has suffered more than other areas. Statistically there have been more deaths than anywhere else, whole villages have disappeared, yet it is still not receiving much government support. The Nepal Trust will support agriculture development and the livelihood of local farming families in this area. Humla is the remotest district in Nepal situated in the far NW of the country. It is very poor with little or no basic infrastructure and a third of children die before their 5th birthday. Our aim is to help bring some stability by providing better education facilities especially for those children who live too far away from existing government schools and cannot travel on a daily basis and in the bitter mountain climate. On behalf of the people of the ‘Hidden Himalayas’ – Thank you!